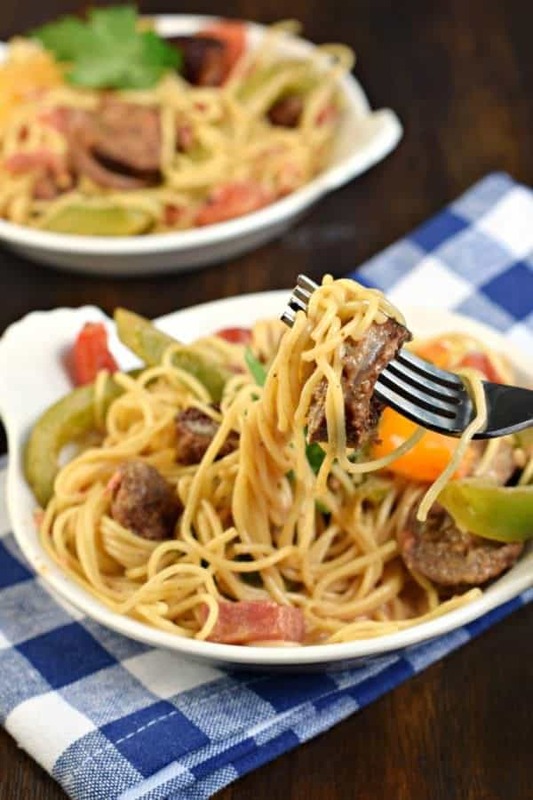 Cajun Sausage Pasta is a delicious 30 minute dinner recipe! Colorful, spicy, and easy to make, you’ll want to put this dish on your menu! Do you ever hear the words “what’s for dinner?” at your house? Now that school is back in session around here, I usually get a text in the middle of the day from my kids wondering, “what’s for dinner.” Like, are they planning ahead and preparing themselves for it? I mean, I get it, I like to know what I’m going to eat too! But I always chuckle when that text comes through (as it’s usually during their lunch hour), always wondering what the next meal will entail. With our crazy after school sports schedule and my husband commuting nearly two hours home every day (yay Chicago traffic! ), I prefer dinners that are quick and easy. If it’s not in the crockpot then it MUST be under 30 minutes! 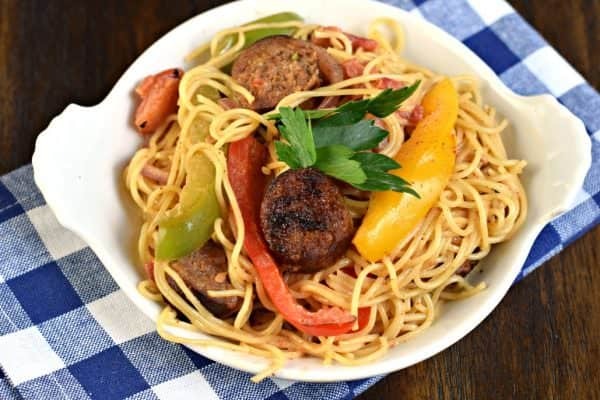 Today’s Cajun Sausage Pasta recipe fits the requirements. It’s easy. It’s delicious. And it’s ready in under 30 minutes! My husband loves cajun food. The spicier the better! However, my girls prefer things a bit tamer. So we compromised. The sauce has a nice kick, however we chose Johnsonville MILD Italian Sausage (instead of the hot version). So flavorful, and it pairs perfectly with this creamy pasta packed with colorful veggies! I also love that the sausage contains no nitrites or nitrates! Speaking of veggies…my garden is still going strong, with peppers, tomatoes, and basically a TREE of basil at this point. The peppers are the perfect addition to this pasta. I used a variety of green bell peppers, red, orange and yellow sweet peppers, and some sliced red onion! I hope you love this dinner as much as my family does! 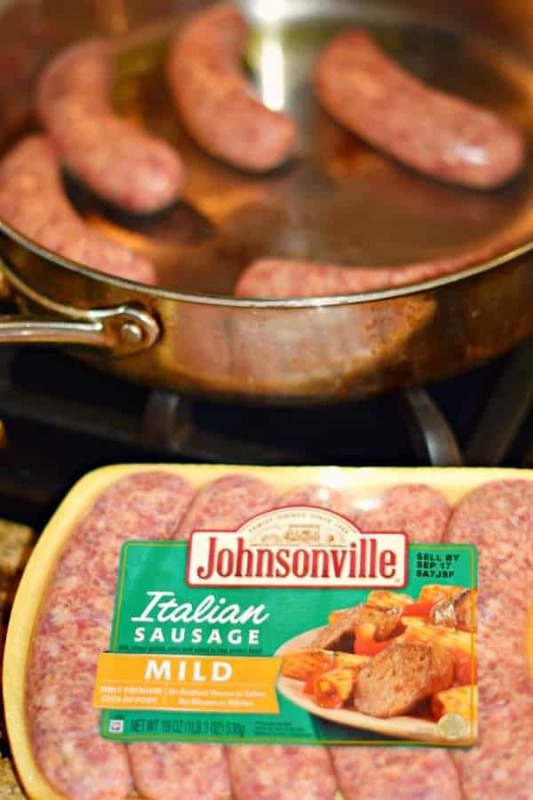 Before you get cooking though, did you know that Johnsonville has a “Sausage Support Center?” You can call or text Johnsonville, and it’s employees are ready to answer any of your questions, whether you are looking for a recipe, or want to know how to make the juiciest brats for tailgating this weekend. I love that the employees are the ones answering the phones in Sheboygan Falls, Wisconsin! I mean, who knows better how to cook a Johnsonville sausage better than the people who make it? You can dial 844-9-SAUSAGE or TEXT 97406 until Friday, September 15th. 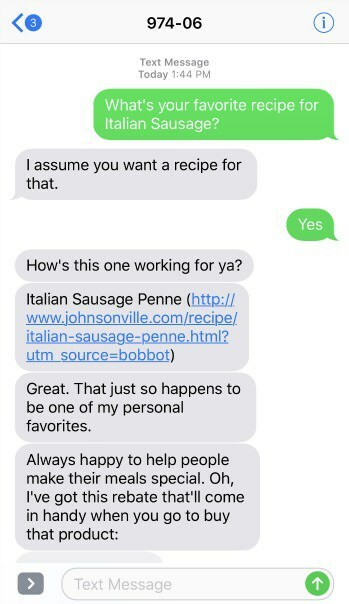 I texted them this week asking “”what’s your favorite recipe for Italian Sausage.” As you can see they suggested Italian Sausage Penne. Clearly that’s only because they don’t know about my Cajun Sausage Pasta recipe yet! Also, bonus, they sent me a link to get a $2.00 rebate when I purchase any Johnsonville Products! So helpful. Before you start cooking, make sure you have all your vegetables prepped and ready! I slice everything up before I begin, makes the process smoother and faster, and nothing gets forgotten. I also start boiling the water for the pasta while I’m cooking. This way it’s done and ready when the sauce is done! We chose Angel Hair pasta, but any spaghetti or linguine would be fantastic too! Even some penne would be perfect! Cook your Italian Sausage for about 5 minutes on one side, roll it over and cook another 5 minutes. Remove from the pan and slice it up into 1 inch slices. You’ll notice it’s not fully cooked. That’s okay. You’ll toss it back into the pan and cook an additional 5 minutes, giving each side a couple minutes to brown up nicely! Add your sliced veggies to the pan with the sausage (once it’s cooked for a total of about 15 minutes). Cook for about 3 minutes, until they begin to soften (you don’t want mushy veggies, so don’t overcook them)! Once you add your seasonings and remaining ingredients, you’ll simmer this on medium for about 10 minutes until warmed and done! Then just toss it with your cooked pasta and enjoy with some french bread! 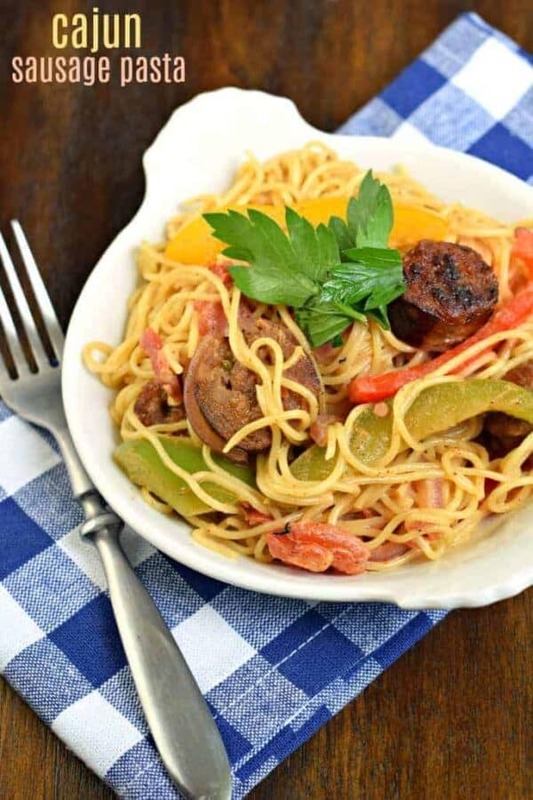 Cajun Sausage Pasta is a delicious 30 minute dinner recipe! 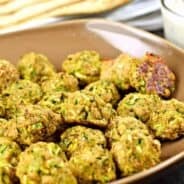 Colorful, spicy, and easy to make, you'll want to put this dish on your menu! In a large skillet (or saucepan), heat olive oil over medium high heat. Add sausage links and cook for 5 minutes. Roll to opposite side and cook an additional 5 minutes. Remove from pan and slice sausage into 1 inch slices. Return to pan and cook an additional 5 minutes, flipping slices over as needed. Add sliced peppers, onion, and garlic to the pan with the sausage. Cook for about 3 minutes over medium high heat, until peppers begin to soften. To this, add the tomatoes, broth, seasoning, and heavy cream. Heat for about 10 minutes on medium heat, covered, until warm. Toss noodles with warm sauce and enjoy! Yes! You can adjust the heat on this one too! 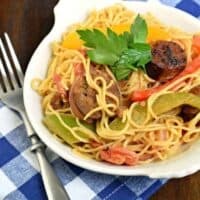 My husband’s three favorite things: cajun, pasta and sausage! I totally agree! it has to be under 30 minutes if it’s not in the crock pot. This looks perfect! LOVE cajun pastas! Thank you! 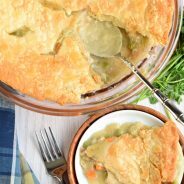 Easy dinners on the weeknights are a MUST! My husband is literally ALWAYS asking me to make him Cajun food! I totally need to add this to my dinner menu this week! We’ve tried a couple of cajun pasta recipes and nothing has seemed to stick. I can’t wait to put this stuff on the shopping list this week. Our whole family loved this one! I can totally relate to those busy after school schedules! Dinner HAS to be easy! 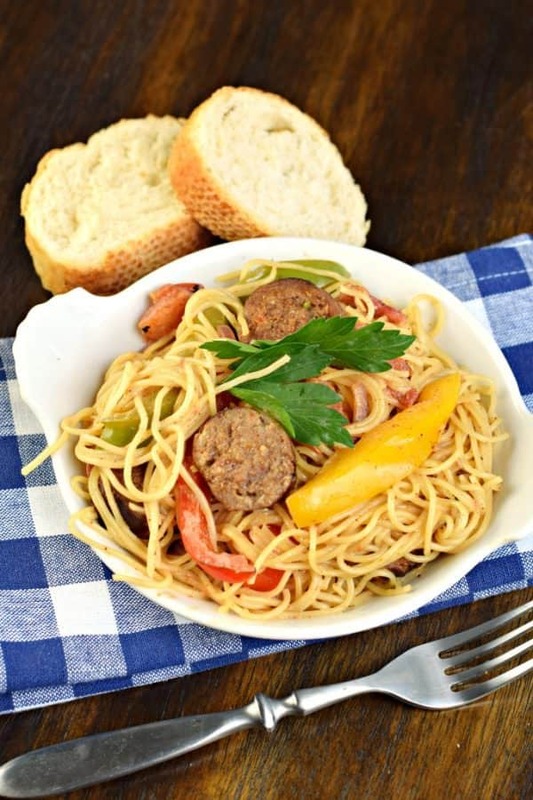 This pasta is fabulous, we all loves a good sausage recipe! I follow the recipe to a ‘T’. However, I also added cooked, cajun seasoned chicken breast to my pasta. What a winner. 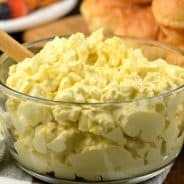 This is a great recipe; a good base recipe. You can add other vegetables; bacon; pepperoni, cooked seasoned steak, etc.